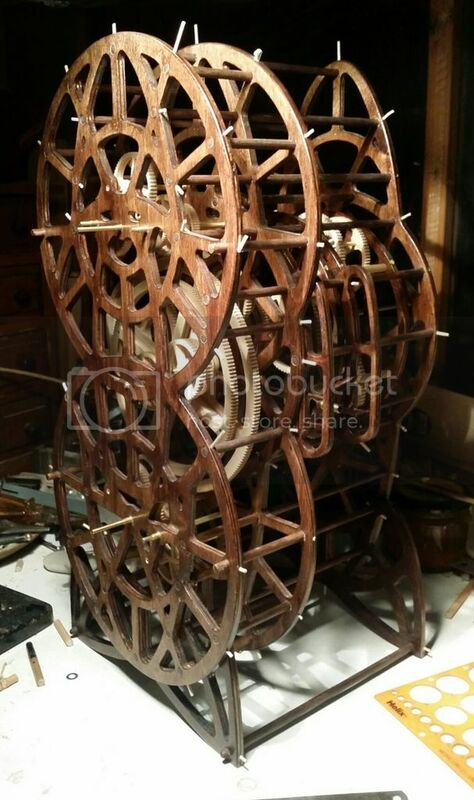 Hi, I'm new here and this thread immediately caught my eye - as an enthusiast of ancient history and clockwork tech. Bloody god job ! Keep it up ! Okay - I'm still not breaking any speed records with this project, but I thought that it was high time I gave a quick update as to how I was getting on. So, the new planet unit is now finished and working exactly as it should, and is definately smoother than the MK1 version. 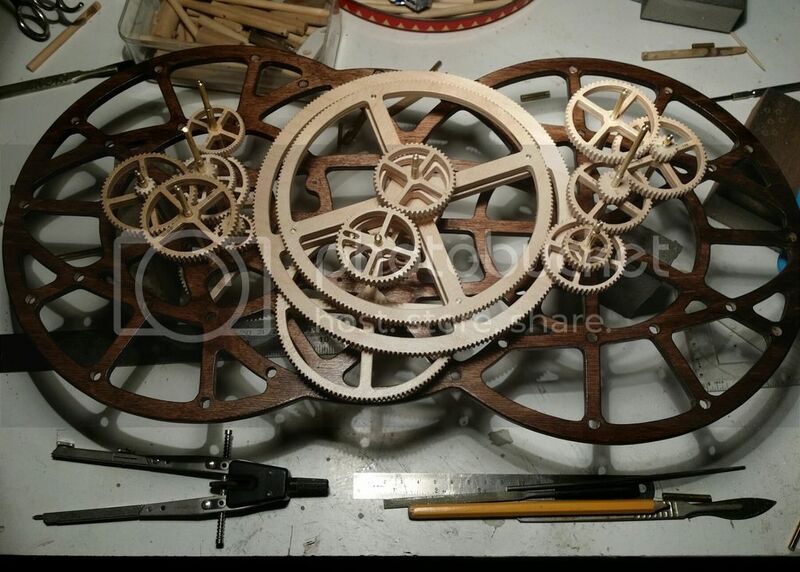 The frames are stained and varnished, and all the remaining gear wheels for the main part of the mechanism are now marked up, centre drilled and ready to cut out. Lots of hours done and lots still to go, but I'm getting there! 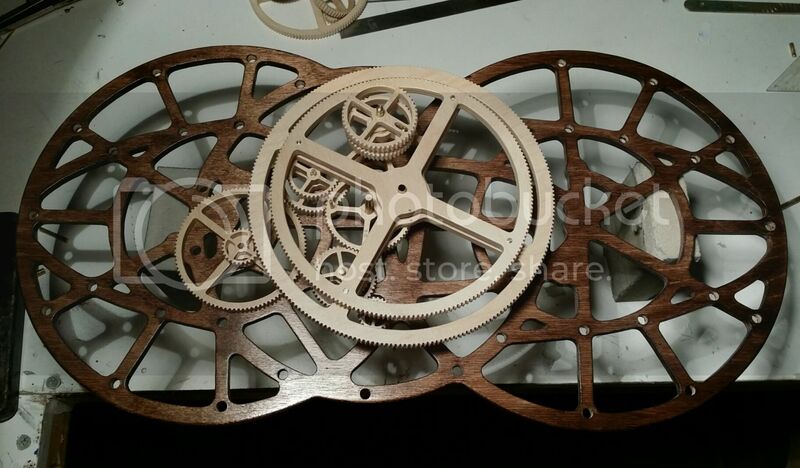 Is there a CNC jigsaw that can cut out those gears? 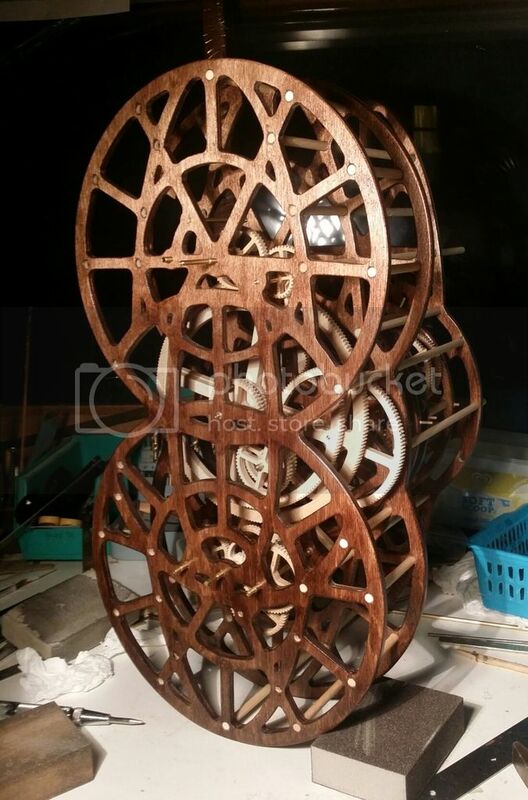 For stability, strength and ease of construction, I use 6mm birch ply for virtually the whole thing - there are some other woods used for some of the components, but the gears and frames are all 6mm ply. 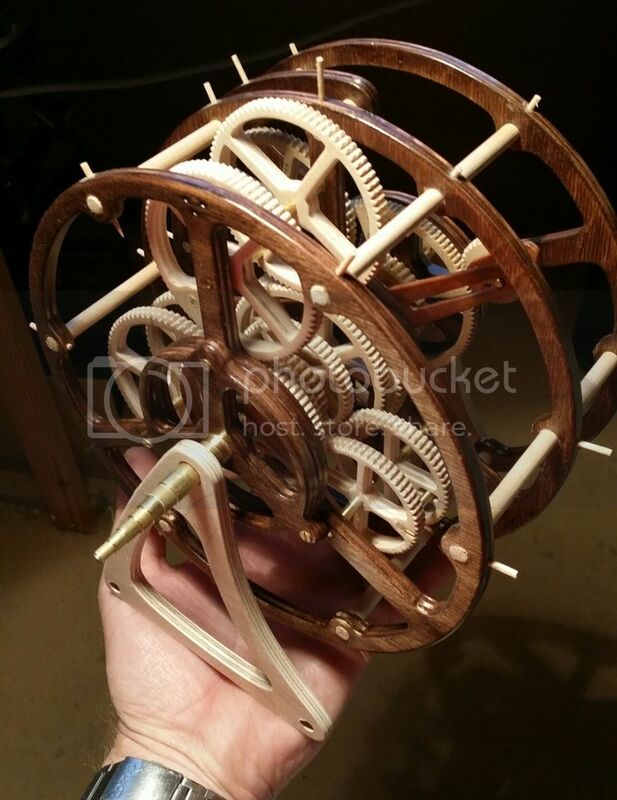 Unfortunately, because the pitch of my gears goes down to just 1.4mm in some instances, I have not found anyone that can cut that thickness of wood down to that sort of accuracy in a single pass without smashing the teeth to pieces. 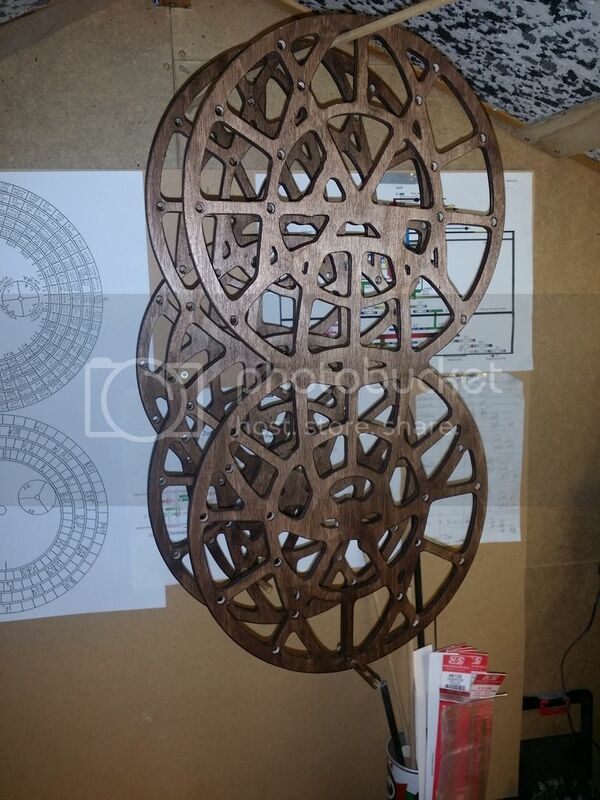 Laser cutting is generally horrible - lots of laser distortion when cutting ply - and water jet cutting is very much the same. 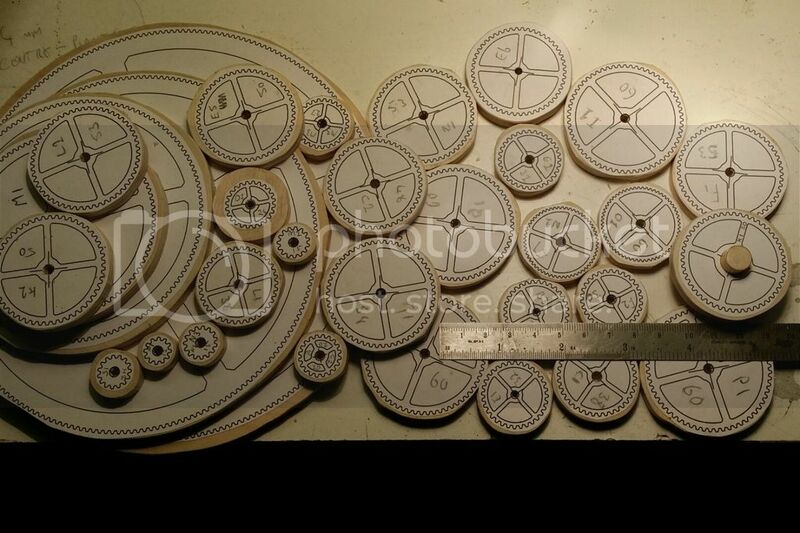 So these will all be hand cut on my trusty fret saw (and I'll save a small fortune in cnc cutting services!). I'm practiced enough now to know that my cutting is accurate enough, and probably not as slow as you'd think! I also think that it's in the spirit of the original to hand cut the gearing - even if it is with a machine rather than a file. Beautiful, and even more beautiful! If the pitch (or module) of the gears are all the same, it might be worth hobbing them after being rough cut - Have a look at "free hobbing" for some ideas. I have cut some gears in nylon using the method, and it worked quite well. 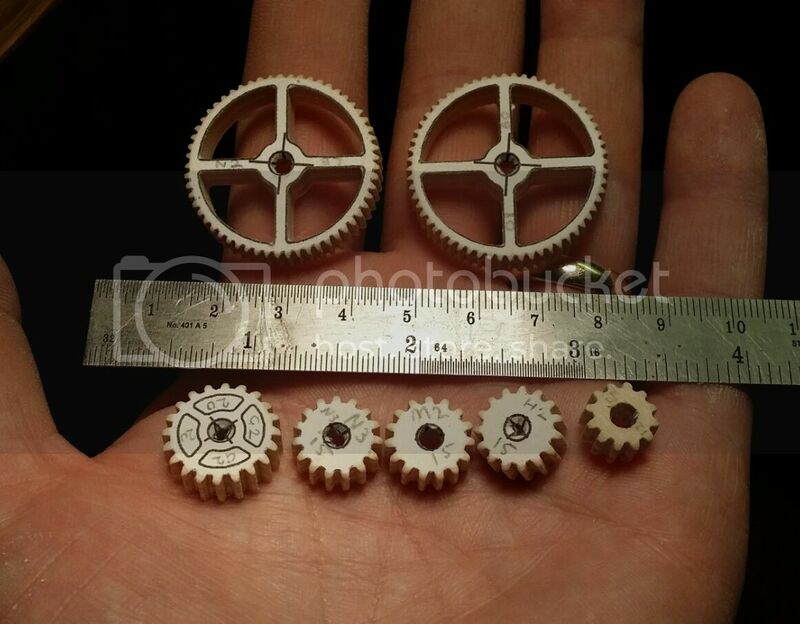 Unfortunately the module of the gear wheels changes a fair bit throughout the machine. This is almost forced upon you as you start to learn how the machines anatomy is effected by gear wheel size and position. I fully intended to keep the module constant through the entire build to keep things easy, but nothing about any of the build has been quite as straightforward as I'd planned. I now fully understand why more people haven't built one! 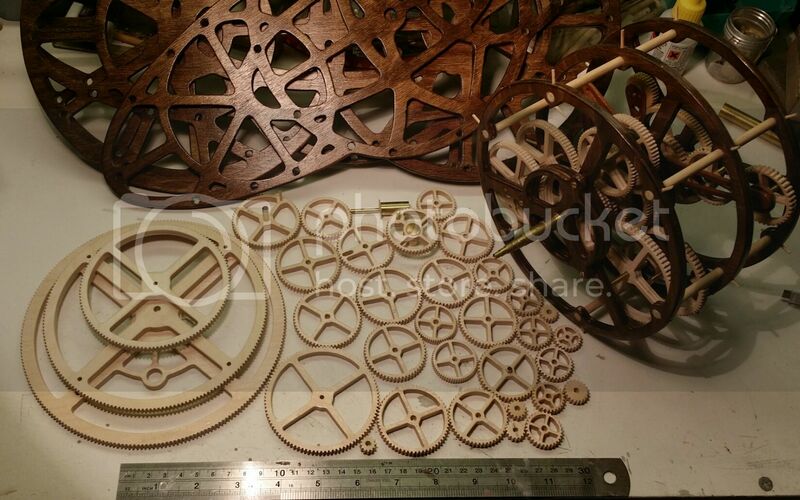 The gear cutting is coming on really well so I'll hopefully have some proper progress to report very soon. At long last, tonight has seen me cut the last gear teeth for the last few gears - hooray!! 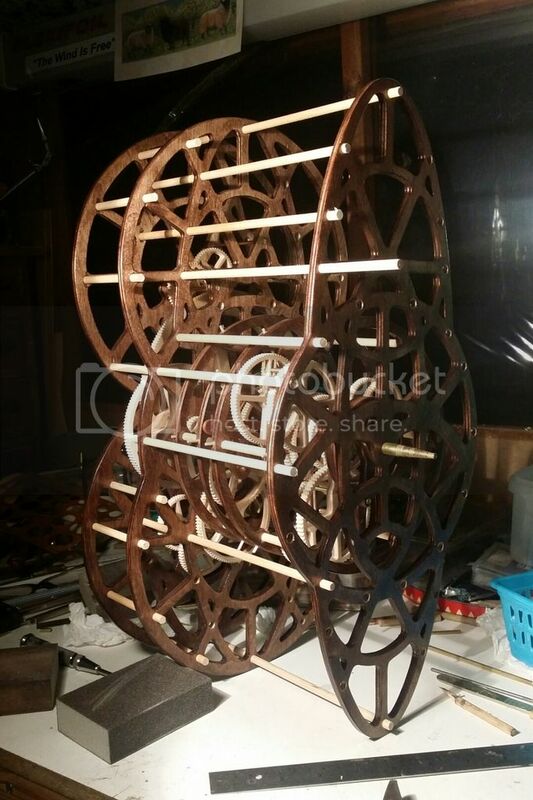 Just a few spokes and varnish to go to see the whole batch finished, and then it's the fun bit - assembly!! Go to it, Mechanism Man! (And yes Banfili - I will! Waiting patiently - love this woodworking stuff! Continue to be in awe. 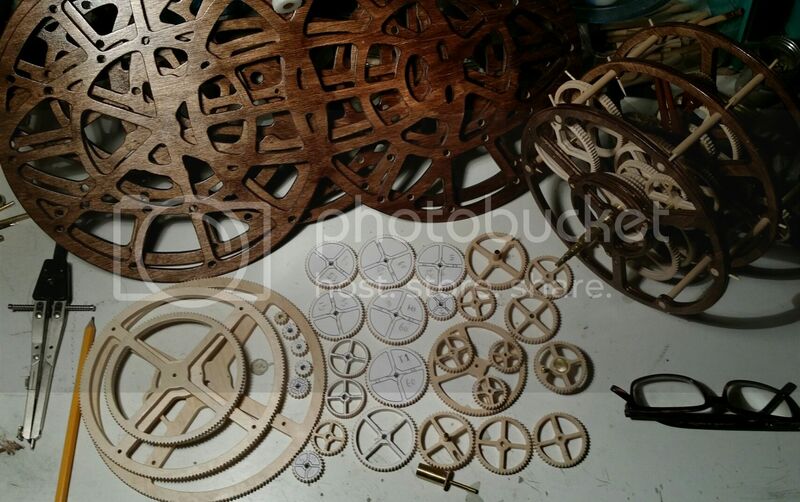 All cut and varnished - let the assembly begin! Looking forward to seeing this complete. Incidentally, have you heard that they have discovered human remains in further excavations of the wreck? Just dropping on a reminder to come back and check progress later. This is a remarkable project! Thanks Crescat - I almost feel like I'm on the home straight now. All the prep and planning is paying off with a build that has - so far at least - caused me very few problems and is actually progressing reasonably quickly. Hi Will - yes I had picked up the news about the remains. They are working hard to bring up as much as possible from the wreck, but I don't think that they expected to find a person after all this time! 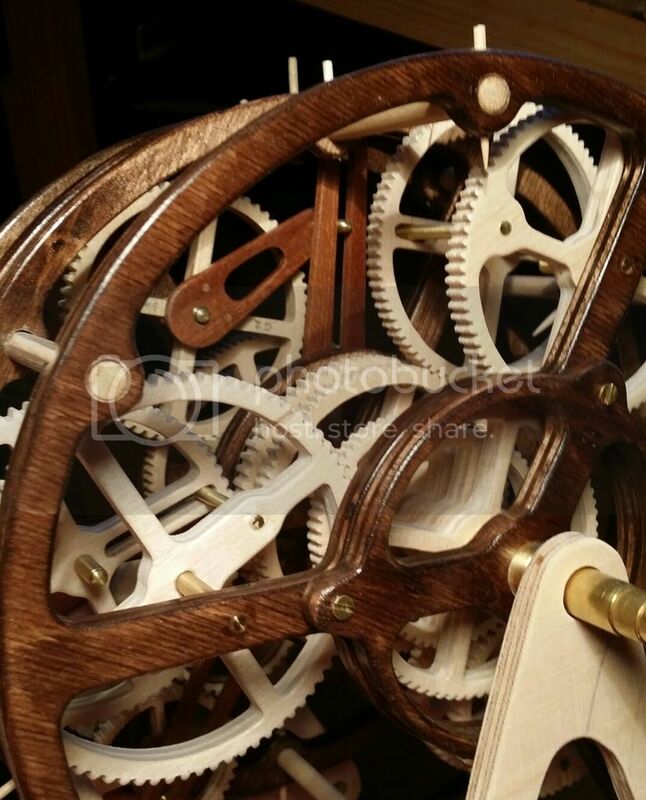 Finding spare time is always a problem, but most of the main gear box gearing is now finally in and working. 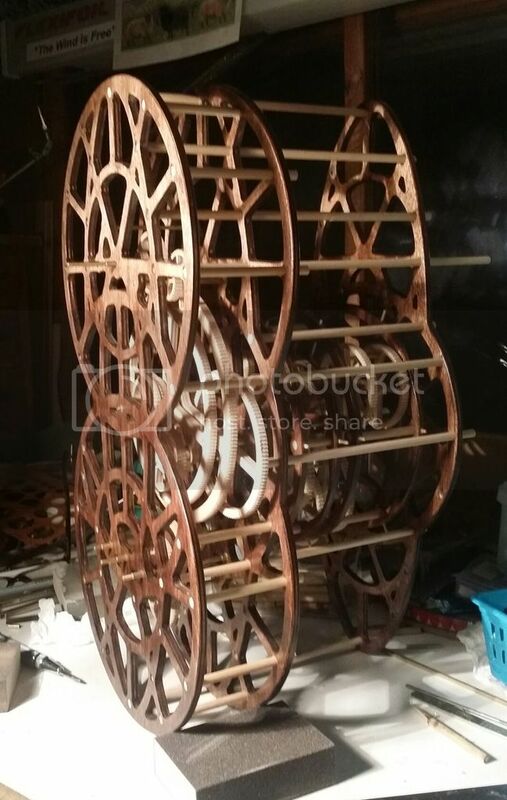 Next job is to fix the gearing to the shafts to prevent slippage, and then it's on to fitting the second frame (which is also the front of the machine) to properly locate the other ends of the shafts. After that I can fit the big planet drive unit to the back of the machine (which I've already built) and the rear frame to hold it all in place. I'm getting there at last! First non functional, cobbled together, and generally bodged test assembly! Now to do it again, but properly. Oooh! Nice, like the other one! Well done, Mechanism! 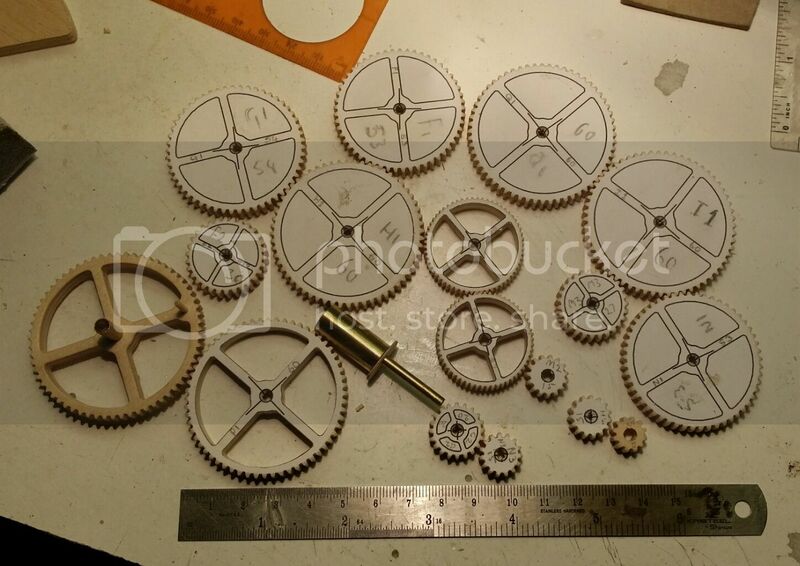 Tonight is going to see me start work on the final two bevel gears that are the final drive for the moon, and then it's time to make the dials to bring it to life. This is the bit that I've been really looking forward to. Can't wait to get it finished now. This is the bit that I've been really looking forward to. As have we all, sir. Tho' 'tis a thing of beauty as it stands. 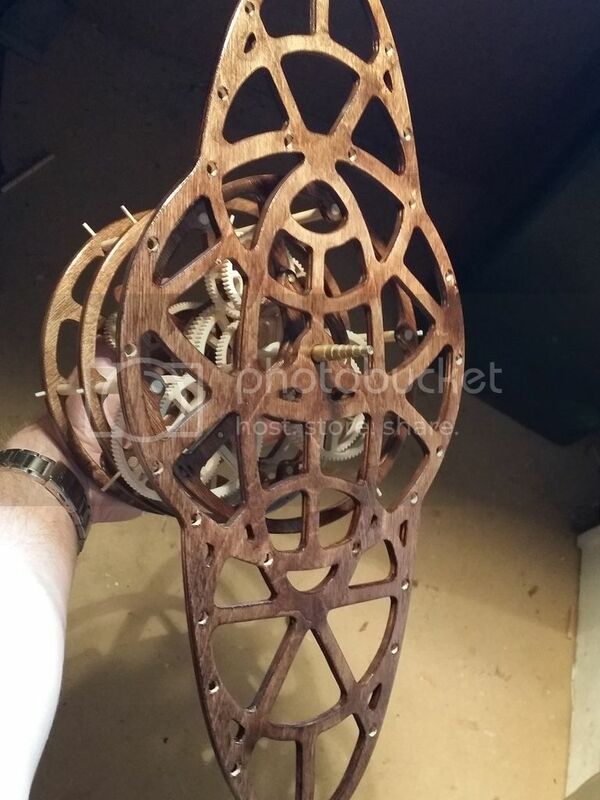 What stunningly brilliant workmanship, sir!